EarthWorks Insitute partners with educators to develop a hands-on curriculum that works with teachers to enhance STEM learning and educational enrichment. These programs are crafted to suit the needs of each community, serve as professional development resources for educators, and enable administrators to sustain an impact in their communities. Thanks to our exceptional Experiential Learning Guides, we’re able to customize learning for specific age groups and give students the confidence to explore the outdoors in a safe and meaningful way. Find your class! Start Your Adventure with Us Today! The expeditions listed below are programs that have been run by EarthWorks, nationwide, and were tailored to meet the needs of each community. When you begin your adventure with us, these examples serve as a starting point for the expedition you’d like to run at your school. 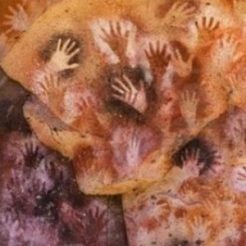 This lesson introduces ancient and forgotten knowledge of primitive technologies and crafts. Our ancestors knew how to use all the gifts nature had to offer to get creative with survival. Students will learn the methods our ancestors used to identify and harvest natural resources, engineering tools, and design everyday items that helped them to evolve as a civilization. We can even work with animal hides, stone tools, wood and plant fiber recreate some of these same relics our ancestors used while making simple but exciting discoveries of our own – cattail for food and fiber, or the versatility of fire for more than just keeping warm. This program isn’t just about time travel, it’s history brought to life! Did you know that humans evolved together with the environment by caring for the land and other living beings, and in return using the resources on earth to survive? This is referred to as “stewardship.” Part of how we passed this ancient knowledge of stewardship on from generation to generation over thousands of years, is through stories. Because there was a time when we did not have the ability to write words or worried that what we could write would be lost, we told each other stories. This is the reason why our plants have common names which remind us of the key things we should know about each plant. Water is one of our most important natural resources. We need it to survive. But do you know what is actually in the water you put in your body every day? 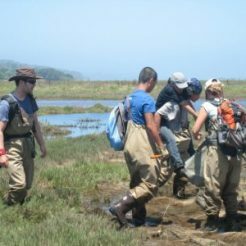 In this program, students will participate in water sampling, aquatic invertebrate identification, and water quality evaluation. Depending on the season, we will either bring your classroom outdoors or bring the outdoors to your classroom to ensure a hands-on experience, guaranteed to deepen students’ knowledge of what’s happening right beneath our feet! A unique survival skills program, Running Wild is designed to teach ancient knowledge and understanding of the natural world combined with unique instruction on the time-honored techniques of wilderness living. 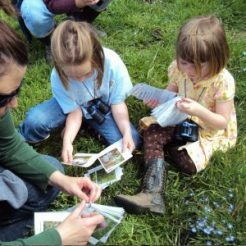 Expect your students to learn about the wonders of their environment and all its natural processes through immersion in a full sensory experience with nature. 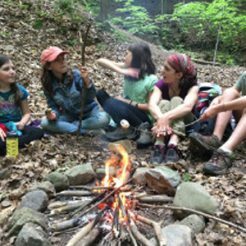 We encourage kids to explore while working closely with peers to practice wilderness skills such as; shelter building, fire making, wildcrafting, identification of flora and fauna, use of plants for food and medicine, purification of water, natural navigation, responsible tool use and more. 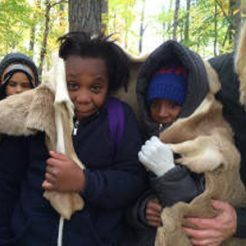 Our curriculum combines unique outdoor games with challenges that give children the confidence to discover the outdoors in a safe and meaningful way. Our goal is to activate each child’s curiosity and love for learning while fostering personal growth, social responsibility, and bonds that last a lifetime. 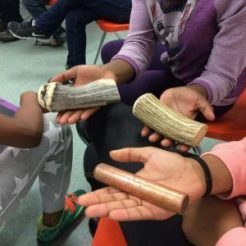 Students combine studies of the Haudenosaunee (Iroquois) people with time-honored restorative justice practices to build a sense of community. This expedition involves pre-trip studies, a day of low ropes and project adventure activities for team-building on-site with teachers and students, and culminates with a trip to Ganondagan State Historic Site full of hiking, fireside storytelling and even an encounter with a legendary figure in peacemaking history, all led by EarthWorks Insitute Experiential Learning Guides. The goal of this program is building trust, community, and fostering a sense of belonging. *Associated readings, reflective writings and other artifacts of learning can be recommended upon request. In a modern world filled with computers, cars, and smartphones, it is easy to forget just how dependent we are on our natural world. The goal of this workshop is to expand our understanding of the world we all live in. 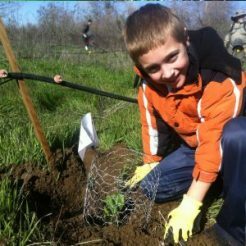 Student’s learn about our ancient relationship with nature and how, for millennia it has provided us with food, medicine, and utility. This hands-on program will provide an opportunity for a hands-on skills demonstration using handmade tools and even a sampling of natural treats! 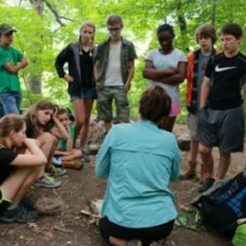 The Survival and Stewardship workshop focuses on the importance of connecting with nature – allowing students to see the world with different eyes to realize their role as stewards of their community and their environment. Farmer, Farmer how does your garden grow? This workshop includes a fun and interactive lesson on plant anatomy using props and role-playing. For the younger (grades 3-5) students, we’ll offer a group activity on wacky plant design and followed up with a jeopardy team challenge to win seeds which the students will get to plant and watch grow in the coming weeks. For the older (grades 6-8) students, we’ll still enjoy an interactive lesson on plant anatomy but they will follow it up by creating their own ecosystem in a bottle, which will explore the impact of various environmental factors – like sunlight and pollutant – on the growth of an ecosystem. The exploration of ecosystems will lead to a discussion about our local environmental impact and a lesson about how we can sustain the preserve the environment for future generations. Did you know that less than 5% of the earth’s surface if farmable land? 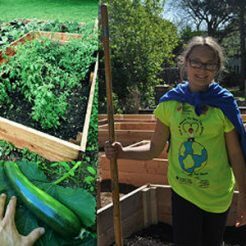 In this workshop, students will participate in several hands-on games and activities that focus on food choices, resource sustainability, and environmental stewardship. Using discussion to promote critical thinking, this workshop informs students about where food comes from, the ecological footprint of the foods we choose to consume, and how the land and resources used for farming are finite. Use It & Lose It! Not everything lasts forever… but how often do we think about that in our daily lives? This program focuses on sustainability, nonrenewable resource use, and scarcity to help students think more critically about what resources we use and how to conserve them. Using class discussion, and a treasure hunt students will work in teams to simulate resource use to understand that searching for limited resources is not as easy as we think. We’ll finish off the program with a unique game of BINGO to bring it all together and help students focus on how truly dependent we all are on such precious commodities. Consider a journey without a compass or a true map. Imagine traveling alone or in groups but with no knowledge of your destination or if you will arrive safely. This was a journey that so many of our ancestors made, some seeking a new beginning and some even seeking their own freedom. Without the ability to purchase or read a map the key to survival is understanding natural navigation or reading signs in nature to determine cardinal direction. In this program students are challenged to consider more than just using the North Star to help them navigate; What might a freedom seeker need to do on a cloudy night for example? This workshop covers lots of fun and hands-on lessons including; lessons on how to establish cardinal directions (where is north? how do we know? what big geographical features are north in this region? 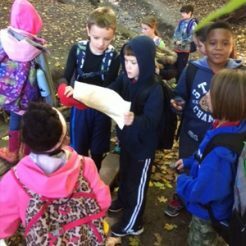 ), creating and practicing use of hand-drawn maps, a full-day excursion to practice aidless navigation outdoors using sundials, “story trails”, a scavenger hunt and real-life journey through a forest to find our way back to ”freedom”. Copyright © 2018 The Center For Youth. All Rights Reserved.